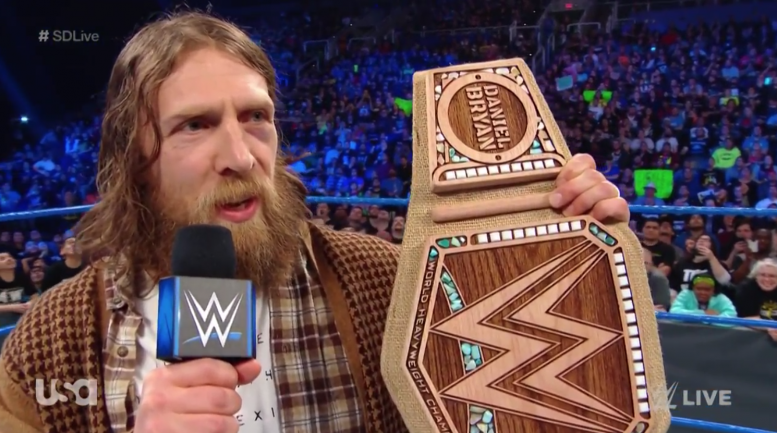 After weeks of promises, Daniel Bryan has finally come through on his vow to create a more sustainable WWE Championship to wear to the ring. It all went down on SmackDown Live this evening after Daniel cut an intense promo about the WWE Championship while standing next to a trash can. He then dumped it in the garbage and asked Rowan to present him with the new belt. Shortly after the announcement … Triple H appeared on the Titantron to announce Daniel Bryan would be defending his new championship inside the Elimination Chamber against Mustafa Ali, Randy Orton, Samoa Joe, AJ Styles and Jeff Hardy. Got any thoughts about the new design? Sound off in the comments!